There are lots of good books about Financial Modelling. As useful as many of them are, they all represent one person's view on how modelling should be done. With the Financial Modelling Handbook project, I am trying to change that by writing a book that draws on the wisdom and experience of the wider modelling community. I was inspired to start the Handbook by books like Business Model Generation, David Roodman's open approach to writing his book Due Diligence, and more recently Unboss. These books were co-created by distributed groups of experts who share a passion for their topic. Over the past few years I have taught lots of people to build models and each time I teach a class I learn just as much as the students. New insights are emerging all the time as people apply the principles of FAST to their area of modelling. It would be a wasted opportunity to write a book without tapping into all that great knowledge. I realise there will be some who think that this is a cynical F1F9 marketing gimmick. It is not. It is an attempt to write a geniunely better modelling book. I will not be making any money from this project and neither will F1F9. It is a non-profit venture. The whole guide will be available for free online. In due course a hard-copy version will be available to purchase. If sales of the hard-copy version generate any profits, these will be given away to charity. We will continue to pubish small sections of the book regularly. These have been grouped together as financial modelling guides. These guides can be viewed and shared online, and freely downloaded in PDF format. They will be updated in response to the feedback we receive. The book is based on the principles of the FAST Standard. It will teach some some essential model build skils, as well as looking at applications in particular domains. There will be lots of worked examples. Find out how to get involved or review what's been published so far. At F1F9 we strive to build sustainable, mutually beneficial partnerships with our suppliers, our customers and our staff. We’re in this for the long term. In addition to donating 1 per cent of our revenue to charity every year, we look for practical ways to contribute to our community. Where possible, we buy from organisations or individuals with a social conscience. When we set up our Delhi office in 2005, we began looking for a charity to support. Our criteria were that it should be local, educational in nature, and we needed to have complete confidence in the ethical integrity of the organisation. Asha met all of these requirements. Asha (which means "hope" in Hindi) works with around 400,000 people in more than 50 slum colonies of Delhi, tackling all the issues that can keep slum dwellers trapped in poverty. Its programmes help slum residents gain access to healthcare, financial services and education, and make it possible for them to make long-term, positive changes to their lives. As a small, growing, entrepreneurial company, F1F9 has limited cash to give. So we instead turned to the one resource we are rich in, namely our energy and our expertise. In late 2010, we suggested to Asha that we offer internships to their students who had made it through to university. The following year, the first “pathfinder” group of 8 Asha students spent 6 weeks of their summer break in our Gurgaon office, 2 of which were spent with our colleagues from accounting firm Mazars. Between Mazars and ourselves we’ve subsequently hosted two more groups - last summer and the summer just gone. Asha students have seen what a university education can lead to. In particular they have learned the critical importance of English in the business world. F1F9 staff have learned that there is less difference and distance between Asha students and themselves. Past interns have found the experience hugely valuable. One of them, Sandeep, told us how his favourite part of the internship was experiencing the co-operation within the company as well as the chance to gain so much knowledge – he missed the team when his internship was over. Chatting confidently in English, Rajeev, another ex-intern, said that he’d advise any potential interns not to think twice about taking part in the programme, as “this opportunity will open up your world”. We've been excited to watch the Internship programme go from strength to strength and we were delighted to have attended Asha’s event at the British High Commission in Delhi on 25 October. The evening celebrated the achievements of the many students from Delhi’s slums who have gained a place at college with the help of Asha’s Higher Education programme. Hundreds of students from the slums are thriving at university, thanks to Asha, and the first graduates are finding jobs in the professional world. Younger slum children are now seeking to follow their example. We’re seeking a Sector Head for Project Finance to take overall responsibility for model build assignments for the sector and generate new model build opportunities. Generate new Project Finance training and model build opportunities. Take overall responsibility for delivery of model build assignments in your sector. Manage and grow our team of model build project managers. Collaborate with our training team to ensure courses reflect latest developments in your sector. Support the Project Finance modelling team based in New Delhi. Have a background in Project Finance modelling, having been a modeller yourself earlier in your career. Be passionate about transparent and efficient modelling, and the need for professional modelling standards. Be willing to adopt and embrace the FAST Modelling Standard. Have solid Project Finance transaction structuring experience (over and beyond modelling). Have proven project and team management skills. This is a senior business development and management role, not a senior modeller role. Be a good conceptual modeller; able to identify the commercial essence of what clients need reflected in their model, and to communicate that succinctly to the modelling team in New Delhi. Have first-rate business development and networking skills. Be happy and able to work from home, with the ability to make yourself an integral part of a geographically distributed team. Be prepared to travel a reasonable amount, and work reasonably flexible hours. Be passionate about providing customised client service. Our models are tailor made to our clients' requirements. Be passionate about continuous improvement and knowledge sharing, with colleagues and customers alike. Already be an advocate of the FAST Modelling Standard. Have experience and knowledge of the energy sector (Oil & Gas, Power, Renewable). Have a solid understanding of accounting, including direct experience of modelling IFRS. Be conversant in a language other than English. To promote and manage a cutting-edge model building service, delivered by a uniquely enthusiastic, well trained, and experienced team in New Delhi. To market and sell a range of high quality modelling training products. To work within a passionate, flexible and un-bureaucratic organisation. To be well rewarded for what you bring to the table. To spend a week working from the New Delhi office a couple of times a year. Oil and gas projects can require investment of many billions of dollars, and can have development times of a decade or more. The amount and timing of the capex spend are critical model inputs and are therefore crucial to the decision making process. Capex modelling has a huge impact on value creation and the future profitability of the project. As a project is developed and engineered, the accuracy and level of detail of the capex estimates and the schedule of spend evolve. S-curves are widely used for modelling project capex profiles. In our latest ebook we explain the origin and application of the s-curve, and provide you with flexible worked example modules in excel, built to the FAST standard, that you can immediately apply in your own modelling. The financial model evolves throughout each stage and modellers will find themselves having to update the capex estimates and profile throughout the process. The excel files provided with the ebook demonstrate a flexible worked example S-curve calculation that allows for efficient updating of capex profiles. Observation and experience gained since the inception of the O&G industry has established the relationship between capex and the S-curve. S-curves are widely used for planning, forecasting and control of cost, time and resources of a project. The worked example excel files are based on the S-curve equation set out in the ebook. This is a powerful tool that modellers can use to manipulate the time variation of capex, prior to a full capex schedule being available. As your project develops, the amount and schedule of the capex will change, and the Financial Modeller will be faced with numerous “what-if” questions. These questions will come from decision makers and stakeholders such as management, the Executive Committee and the Board. For those scenarios where the schedule estimate is altered, an existing S-curve, expressed in the format of percentage capex versus percentage of time, can be used as the basis to produce a revised capex profile for the new schedule. Once again during October we smashed the industry benchmark of 87% for customer satisfaction – for the fourth month in a row we had a fantastic result of 100% customer satisfaction. We are delighted to be maintaining these high standards and look to continue this performance. On its own this performance is a powerful measure of the effort and commitment our support and training staff demonstrate, but when combined with more detailed analysis it shows why as a company more businesses are choosing our financial modelling solutions. Our average response time for support in October was 9.6 hours which is almost half the industry benchmark of 18 hours, with almost a third of questions receiving a response within an hour. 9/10 of questions were responded to within 24 hours which is a great result for our customers. We received some very positive comments from our customers this month including “Great and speedy help and support.” and “Wonderful support”. We are always interested to hear from other modelling professionals or about your experiences with training – Feel free to leave a comment about your experiences or let us know if you have a question. This blog post is also featured as a guest blog on the www.one-search.co.uk website. At some stage in every financial modelling career, there comes a time when you're required to present the results of your analysis. I've seen lots of modellers present, and these 10 mistakes keep coming up. Avoid these presentation pitfalls, and hopefully you'll find your career progressing faster! 1. REMEMBER THAT THE FUTURE IS A RANGE, NOT A POINT. The future of any business or project is a range of possible outcomes. The question is how likely is each outcome? When you present the results of your modelling as a range of possible outcomes it helps everybody to think through the risks, including the unknown unknowns. I’m amazed at how many presentations talk about a single point base case estimate of some metric, often IRR. Sometimes to 4 decimal places. Just because your base case model is showing an IRR of 14.2345% - don't be tricked into thinking that this is what is actually going to happen. The only thing you can say with any confidence about your base case is "this is what isn't going to happen". 2. TALK ABOUT THE BUSINESS, NOT THE MODEL. Nobody is there to talk about the model. It's your job to translate what the model is telling you into business insights, and then communicate them effectively. Spending time walking somebody through your spreadsheet is rarely a good use of time. Unless they’ve asked for it specifically, and even then . . . ! 3. DON'T BELIEVE YOUR MODEL. You are smarter than your model. When you are running sensitivities or changing your model, make sure you have a hypothesis first about how the model is going to react. If the model doesn't react the way you expect, your first position should be that the model is wrong. 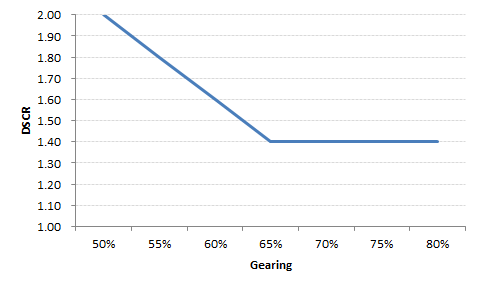 The base case gearing was 65%. The model worked at lower levels of gearing as the model was able to draw down less debt, but not at higher levels due to the headroom constraint. Quite a few students made this mistake; but instead of trusting their intuition that when you increase debt, cover ratios must decrease, they believed what the model told them, and set about trying to explain it. There were all sorts of wonderful reasons why increasing debt didn't mean lower coverage ratios. Rather than rationalising reasons that your model doesn't act the way you expected it to, you should be looking for an explanation of what the model is telling you. 4. THINK ABOUT WHAT INTERESTS THE AUDIENCE, NOT WHAT INTERESTS YOU. Interesting to model doesn't mean interesting to your audience, and it doesn't mean it's material to the business. Just because something was "interesting to model" doesn't mean it should automatically go into your presentation. In fact it’s a relatively reliable indicator that it shouldn’t. 5. THINK "SO WHAT" FOR EVERY SLIDE YOU PUT IN FRONT OF AN AUDIENCE. Every slide must have a "so what". If you don't know what the point of a slide or graph is, drop it from the deck. Ask this question of every piece of information you put in your deck. Some analysts think that if you just present enough data then people will get it. If you’re that analyst you’re not going like this: when you make a presentation you're telling a story. While you want to show data, your audience is longing for insight. You want to chart every line in your model, your audience wants to understand what decisions they need to take. Use the appropriate chart for the type of data you are presenting. If you don't know how to action points 2 or 3, Stephen Few will teach you. Bottom Line Up Front. Lead with your conclusions. If the purpose of your presentation is to ask for an investment of $1.5 billion dollars in your infrastructure project, start with that. Say "The purpose of my presentation is to ask for $1.5 billion to invest in Project X. I'm going to talk you through the rationale for the project and we're then going to look at the key risks, and how we are going to manage those risks". In college you're told to end with your conclusions. In business you have to start with them. Don't talk for 20 minutes keeping people guessing about what it is that you actually want them to do. The only acceptable answer to a question you don't know the answer to is "I don't know the answer to that question". No matter how slick you think you are, your audience can smell your BS a mile off. They will then apply a BS discount factor to everything that comes out of your mouth from that point onwards. Conversely, if you don't know, and you're honest about it, it builds trust. Unless you don't know the answer to any of the questions they ask, in which you shouldn't be making the presentation in the first place. Your audience want reassurance that you understand the risks of the business venture you are modelling. Blindly telling them that everything is going to be OK is not going to cut it. Your infectious enthusiasm for the sector is going to make your presentation more enjoyable, (see point 10), but it's not going to persuade anybody to part with $1.5 billion unless they know that you know where the risks lie and how you are going to manage them. It's a slow painful death for your audience. If the presentation is worth doing, it's worth doing properly. Learn your material. Or don't turn up. 10. PUT SOME LIFE INTO IT. Don't phone in your performance. Get out in front of your audience. Use a remote slide clicker - they cost a few dollars. Make eye contact with every single person in your audience, in turn, constantly. Vary your voice. When you're making a presentation, you control the energy in the room. If you're not putting energy into the room, you're taking it out. Choose. It may seem a little odd that one of the key foundations of business over the last 25 years has been the humble spreadsheet. Yet it is hard to find a key financial decision that has not been based on calculations made in this ubiquitous software tool. As our e-book shows, nightmares lurk amongst the innocent rows and columns of figures for those that don’t take care with how they process their figures. Research has shown that 88% of spreadsheets contain errors of some sort and approximately 50% of financial models in use operationally in large businesses have material defects. Many different organisations have been hit by spreadsheet problems in a variety of ways. The root causes of many are surprisingly simple errors. MI5 admitted that they had bugged 134 of the wrong phones because of a spreadsheet formatting problem. Oxford University candidates experienced interview upheaval when administrators muddled up spreadsheet numbers for registration and examination marks. Unsurprisingly, spreadsheet problems are seen most in the world of finance where the values involved can be terrifying and the financial calculations can become extremely complicated. An eagle-eyed reader of a US Federal Reserve statement spotted a hitherto unnoticed error in a spreadsheet worth up to 4 billion dollars. Who knows the value of the financial impact of the spreadsheet error found in the published research papers of leading Harvard economists, Carmen Reinhart and Kenneth Rogoff? Their flawed research has been claimed as a basis of several countries’ current economic austerity programmes. The problems highlighted are not only embarrassing for those involved, they can be costly both in terms of money wasted and in jobs that are lost. At least one CEO has had to resign as a result of errors being discovered in figures that they had previously announced. The stories which have attracted uncomfortable publicity are only the tip of the iceberg. There must be many more unpublicised spreadsheet skeletons lurking in the cupboards of many an accounting department. What 3 things should managers responsible for building and operating spreadsheets do? 1. Adopt a standard for creating spreadsheets that can be followed by people in your organisation. The FAST standard is the only internationally recognised standard for building spreadsheets. It is managed by an independent standards organisation, which is backed by F1F9 as well as international accounting firms, Grant Thornton and Mazars. FAST defines a Flexible, Appropriate, Structured and Transparent approach for creating understandable spreadsheets and reducing errors. It still gives users the freedom they need to tailor their calculations to particular business needs but it also imposes simple disciplines that mean that their work is understandable. Most importantly its adoption means that errors can be spotted. 2. Ensure that procedures are in place for managing spreadsheets and the IT environment where they are saved and shared. Simple version control and file numbering processes which identify clear responsibility for who is in charge of spreadsheet updates. Many errors are caused because the wrong version of a spreadsheet is updated or viewed. Review of spreadsheet work ranging from sense-checks of model outputs to independent examination of the spreadsheet coding for more complicated applications. Routines for regular communication between those making and managing commercial decisions and those who are building spreadsheets to ensure that correct assumptions are used. Control and audit procedures to identify and track who can access and has updated spreadsheet files. 3. Pay attention to the human-side of spreadsheet control. Make people aware of the risks of working with spreadsheets and provide training in how to build and manage them safely and efficiently. A culture of positive collaboration and improvement should be encouraged where good design and error elimination is promoted with clearly defined responsibilities. Given that spreadsheets have been around for over 25 years, it seems surprising that businesses have not mastered ways to manage them yet. But the truth is that high profile errors keep appearing. Part of the problem seems to be a philosophical one. Because the nature of Excel use is everyday and accessible, many managers just don’t look on it as something that needs managed in the same controlled way as other computer systems. Some have already become enlightened. Others have not, to their cost. During August we maintained our very high standards and achieved a second month in a row with 100% customer satisfaction. As with any business, we always aim to achieve 100% satisfaction and to continue at this high level of performance is a great endorsement for our support and training staff. The industry benchmark is 87%. Our average response time for August was 9.7 hours which is almost half the industry benchmark of 18 hours, with nearly a quarter of questions receiving a response within an hour. A satisfied customer this month commented: “The support I received was beyond what I expected and the training has been wonderful, as well. I am so grateful to have such a great tool that is run by such competent staff. It is rare to have such good service. Thank you!”. As mentioned in our previous update, we have expanded our time zones for training support – we now have modellers based in the USA who are available to work on support queries that come in at different times. We are always interested to hear from other modelling professionals, or about your experiences with training – Feel free to leave a comment about your experiences or let us know if you have a question. What can financial modellers learn from car manufacturers? A recent article in the Financial Times highlights how the motor industry has adopted a modular approach to building cars. Volkswagen believes that by standardising elements of the production line, and by using standard modules in vehicle construction, they can grow to become the world’s biggest car manufacturer. This approach has won them awards for innovation and has shown other manufacturers and industries that taking a modular approach can increase efficiencies, save time and improve output. How can this approach be applied to the world of financial modelling? At F1F9 we take the same approach to building financial models. We have found that modularity is the key to modelling productivity, and standards are the key to modularity. Although no two modelling assignments are the same, there are plenty of elements in common. This means that a “plug and play” approach to modelling is possible – and beneficial. This makes FAST modelling very efficient. For example, in a FAST modelling assignment, we at F1F9 can be confident of spending 80 per cent of the time on 20 per cent of the model – those parts of the model that really need our attention because they are highly specialised, innovative or particularly risky. How is this efficiency possible? Because FAST financial models are built with standards in mind. Models built with the FAST standard incorporate standard modules with ease – just like Volkswagen’s production line. FAST models use links and calculation blocks to take standard modules and make the coding specific. That coding, in turn, is understandable and reusable elsewhere in the model. A modeller within F1F9 may expect to undertake very little blue sky modelling. Instead, there is a focus on recycling information and coding that has been used before. That leads to productivity gains and efficiency. And it is all made possible through standards. To get a better understanding of how the FAST standard makes it possible to build reusable, modular code in financial models, please take a look at our without obligation free course 31 days to better financial modelling. – This course will guide you through some key FAST principles and offer excellent tips that will help you improve your modelling immediately. To learn more, our FAST financial modelling, and FAST project finance modelling courses both make extensive use of modular code sections that enable you construct models more easily, in less time, with fewer errors and with greater confidence.